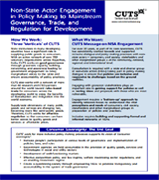 Making Policy Work for the People - Has CUTS been successful? If you have any grievance against any product purchased, services rendered or if any advise pertaining to consumer protection is sought, please register with us for redressal. CUTS comments on the draft Model Agriculture Produce & Livestock Contract Farming and Services (Promotion and Facilitation) Acy, 2018. CUTS submission of memorandum to Sub-Committee on Ease of Doing Business of Department-Related Standing Committee on Commerce, Rajya Sabha on August 17, 2015. CUTS Comments on the revised draft of the Indian Financial Code on August 08, 2015. CUTS Comments to the Joint Parliamentary Committee on The Right to Fair Compensation and Transparency in Land Acquisition, Rehabilitation and Resettlement (Second Amendment) Bill, 2015. CUTS Submission of Comments to the Central Board of Direct Taxes (CBDT) on “Draft scheme of the proposed rules for computation of Arm’s Length Price (ALP) of an International Transaction or Specified Domestic Transaction on or after 01.04.2014” on May 27, 2015. CUTS Submission of Comments to the Department of Economic Affairs (Financial Market Division), Ministry of Finance, Government of India on “Sahoo Committee’s Report on Foreign Currency Borrowings” on May 10, 2015. CUTS Comments on the Bibek Debroy Panel report on Restructuring Railways on April 29, 2015. CUTS Comments on the “Proposed Amendments to the Competition Commission of India (Procedure in regard to the transaction of business relating to combinations) Regulations, 2011” on April 23, 2015. CUTS Submission of Comments to the (SEBI) on “Discussion Paper on Alternate Capital Raising Platform and Review of other regulatory requirements" on April 20, 2015. CUTS Submission of Comments to the (SEBI) on “Discussion Paper on Issues Pertaining to Offer for Sale of Shares (OFS) through Stock Exchange Mechanism" on April 18, 2015. CUTS comments on the report of RBI internal working group to revisit the existing priority sector lending guidelines on March 15, 2015. CUTS Comments on National Health Policy (Draft) Released by Ministry of Health & Family Welfare, Government of India on February 17, 2015. Letter to Prime Minister on 'Trade potential between India and Pakistan' on January 15, 2015. CUTS London Resource Centre has been closed and its activities/operations have been shifted to CUTS Geneva Resource Centre. Consequently CUTS London Resource Centre website www.cuts-london.org has been allowed to lapse and CUTS is neither its owner nor responsible for its use. Parliamentarians’ Forum on Economic Policy Issues has been formed at the behest of five Parliamentarians cutting across party lines to facilitate discussions on a periodic basis among MPs on the core economic policy issues reflected in and out of parliament and media. The forum is non-partisan and informal.